Fluorescein angiography involves photographing the retina with special filters after injection of a tracer dye intravenously. Fluorescein angiography is an eye test that uses a special dye and camera to look at blood flow through the retinal vessels. Since fluorescein dye does not leak through retinal vessels with an intact capillary endothelium and does not leak through an intact retinal pigment epithelium, its behavoir during the test can help assess abnormalities in the retinal vessels and the retinal pigment epithelium. The test is usually performed with a dilated pupil. The dye used is a vegetable based dye and rarely causes serious reactions. After the dye is injected in a vein, a photograph is taken using blue light (wavelength 465-490 nm) which is absorbed by the fluorescein molecules. 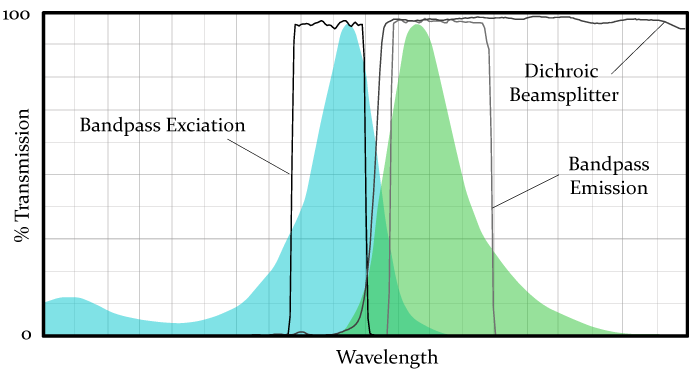 The molecules fluoresce and emit light with a longer wavelength in the yellow-green spectrum (520-530nm). A barrier filter blocks any reflected light so that the images capture only light emitted from the fluorescein. Images are acquired immediately after injection and continue for ten minutes depending on the pathology being imaged. 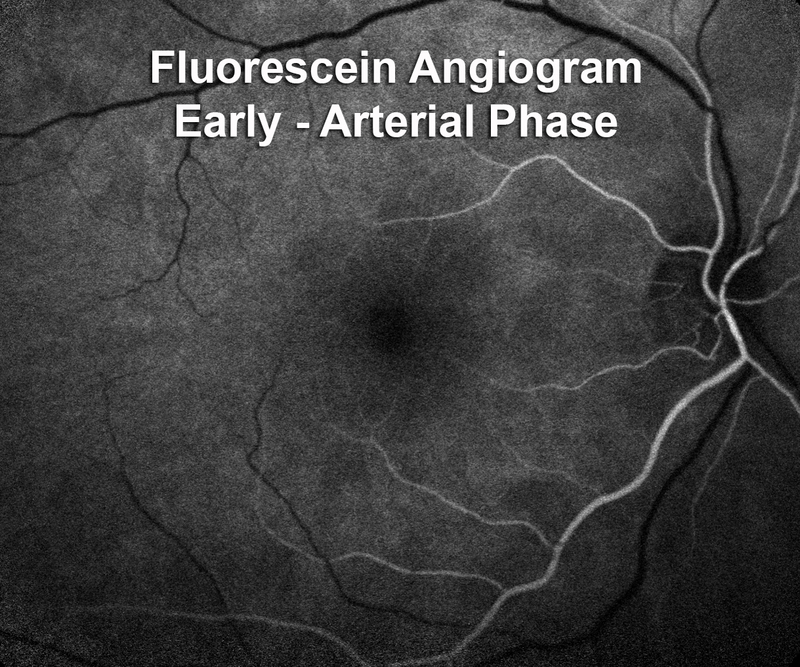 What is a normal fluorescein angiogram? It is helpful to look at a normal example of an angiogram to understand the abnormal examples listed below. The normal image accompanying this text shows the retinal arteriols as white. In this images, the fluorescein dye has just entered the retinal vessels. The venules are still dark because the fluorescein dye has not yet reached them. The light that is emitted from the fluorescein molecules is confined to the retinal vessels. There is also a faint white background which is emitted from the fluorescein molecules in the choroidal vessels. This background is largely obscured by an intact retinal pigment epithelium, a pigmented layer underneath the retina. There is a somewhat dark spot in the center of the image which is where the fluorecein in the choroidal vessels is blocked by the macular pigment (lutein and zeaxanthin). The angiogram is also usually dark over the circle off center which is the head of the optic nerve. 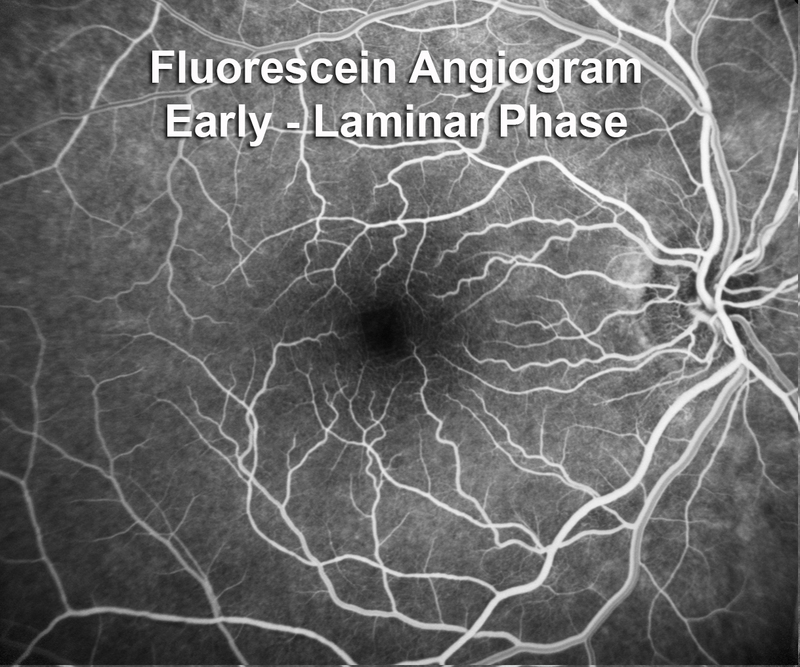 Fluorescein angriograms are interpreted over time. 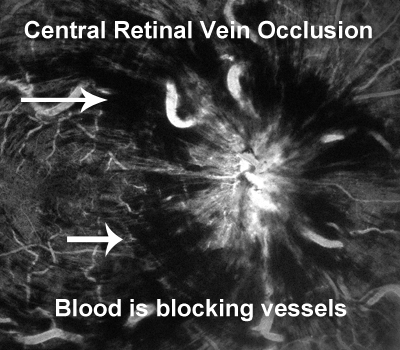 The early images show the dye confined to the retinal vessels and is intravascular. The late images show where the dye has leaked from the vessels and is extravascular. Dye doesn't leak from intact retinal vessels. It can stain the optic nerve head and it does leak from the choriodal capillaries. Immediately after the retinal artioles fill, the veins start to fill. The image with this text shows the veins almost but not quiet full. There is a little dark in the middle of the retinal veins. The dye fills the side of the veins first because the circulation enters the large veins from the vessel wall. Therefore the walls start to fill first. During this early image, the dye is still confined to the retinal vessels and will show any irregularities or blockages in the retinal arteriols or venules. Also, if the dark layer under the retina, the retinal pigment epithelium, has any defects, they will often become evident at this point in the fluorescein angiogram because the underlying circulation from the choroid is usually filled at this point in the study. When the retinal vessels leak, the area where the leakage is shows up as white in the later frames of the angiogram. 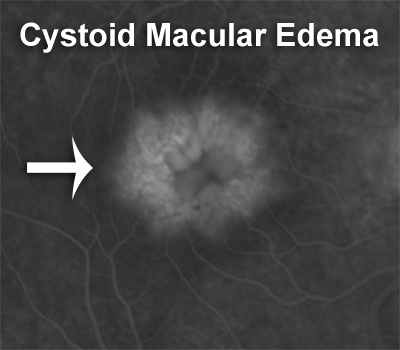 A striking example of this is cystoid macular edema. Sometimes it is called petalloid cystoid macular edema because the white pattern in the center of the macula where retinal cysts are filling with leaking fluorescein dye look like petals on a flower. The example shown here is from a patient who had cataract surgery and developed post-operative pseudophakic cystoid macular edema. When you cannot see the normal underlying background fluorescence, it is called blockage. One striking example of this occurs when there is blood in the back of the eye under the retina as shown in the accompanying image.